Th-INK-ing of You: ODBD April 1 Release Blog Hop & News! Welcome to the Our Daily Bread Designs April 1 Release Blog Hop! If you got here from Dawns Blog, you are in the right place! If you just happened here, you might want to hop on over to the ODBD Blog and start from there so you don't miss a chance to win any of the four great prizes this month, and pick up all the details there! You have until Monday April 2, 8PM EDT to complete the hop! We do have one announcement we want to be sure you get! We have decided to extend our Customer Favorites Contest! You now have until April 7th to add your submission to the Customer Favorites Contest for a chance to win a free set and the chance to be a guest designer for the release of "your" set! So leave us your ONE choice of favorite short Scripture, spiritual quote or spiritual sentiment, and YOUR submission might be in the next ODBD Customer Favorites Sets! Read all the details and leave your submission HERE! ***PLEASE take time to see the Scriptures already in sets list so you don't waste your one submission on one that's already in a set! I used the Prayer of St. Francis, which we all are familiar with if for no other reason than having heard the song that was made using the words of this prayer. I have been singing that song ever since I created this card! LOL! Anyway... my card base is Bazzill and is cut with Spellbinders Labels 23 Grand. The prayer is stamped on My Mind's Eye Bella Bella dp. I used Cheery Lynn Exotic Butterflies Small, Versafine Sepia Ink, Martha Stewart bough punch,ZVA Creative small white roses, and the larger pink rose if from the bridal dept. at Micheal's. This was super quick and easy but with the cut shape, it packs quite a punch! Thanks so much for visiting... now from here you'll hop to Sabrina's Scrumptious Blog! This card is so well cone and so classey. It could be used for a guy or a gal. Beautiful clean and crisp job. I love the beautiful colors and simplicity of your card. I love the prayer of St. Francis and also the song. This is simply beautiful! what a blessed way to enliven the st francis prayer. love the flowers. beautiful card. What a great idea for use of the dies. This card is so classy, plus that prayer would also be comfort this would be an awesome card to send. I love your creativity and ideas and always love to visit your blog. Thanks for all the work you put into this. Thanks for sharing this and blessings to you. This card is so beautiful. It is perfect. This would make a great plaque too. All these cards on this blog are stunning. This is beautiful Grace! Love the shape and the prayer. Beautiful card... I love the die cut and the stamp. Beautiful card!! I love that prayer and it's so great for friends! Grace this is absolutely stunning!!! I really need to do more shaped cards! You have inspired me!!! Gorgeous card. I love this poem, and you have showcased it so nicely. I like the way you centered the rose in the butterfly die. Beautiful card Grace! Love that it is shaped and I love the prayer of St Francis! Beautiful, Grace! I love the elegant shape and the sepia tones are so elegant. Your corsage in the corner adds just the right touch of color. What an elegant looking card. Your colours also make it have that elegant look. Very nice. I like the shape of the card and the use of brown instead of black. Beautiful is looks so old as if its been someones favorite for many years !! What a FABULOUS card! I love all the elements you incorporated. This prayer is definitely one that would benefit all of us if we remembered to put it into practice daily. WOW! This card is fantastic. Wow how Gorgeous your Card is. i love the die you chose its my Favorite die to use. Love the colors and the Sentiment is great. love love the roses and the butterfly. thanks for sharing. ps would you think about doing a titorial of how you make the cards with this kind of dies it sure would be great. How beautiful Grace. This is one of my all time favorite shapes! 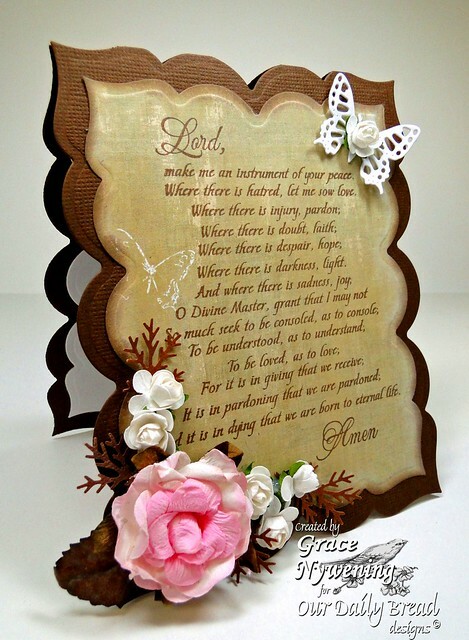 Grace, I too love that you used the die cut and I'm thrilled someone made a sample with the prayer -- your colors are so perfect for the Franciscans! I like how the prayer on your card is the centre of attention. Like the prayer is what is getting crafted around. Nice idea and beauty card. This one is a double treat, beautiful for the eyes and for the soul. Beautiful work of Art. It would be lovely Framed. Beautiful! Love how you made the prayer the focus, love the shapes and colors you used. gorgeous!! love the shape of the card as well!! What an awesome card! Love that the wonderful prayer is so giftedly made the centerpiece. Wow. Gorgeous card! The tan, beige, brown colors are perfect for the prayer, set off nicely with your lovely embellishments. Beautiful color & lovely card Grace. Such a beautiful card. And the prayer is the perfect touch. Love it. Serene and beautiful! Lovely card!!! Such a beautiful card with the verse as a focal point. Everytime I visit you site, I almost cry from the music. I love that song! Beautiful card, love the colors and the prayer! Beautiful card Grace. Love the colors and the shape is a wonderful added touch. Very nice. Might want to try it sometime. Background music was great! Lovely! I love the shape of the card and the awesome colors as well. TFS! Grace, I have nothing but complete respect for your awesome talent. I always stop to analyse what you have done and how you have done it in the hope some of it might rub off on me, lol. Wow! Thanks for sharing this. Fantastic. Absolutely love everything about this card - especially the shape. Grace: This is a WOW card!!! So beautiful. Love the colors. you could frame it and hang it on the wall. I love this card. The shape, flowers and colors are beautiful, and the prayer is such a wonderful one. Grace, this is stunning. Beautiful card design and coloring. I am on my way to Michael's - that rose is gorgeous. Gorgeous card! Love that the prayer is the main attraction! Fabulous job. Lovely card--I like the shape and embellishments. Beautiful card with a lovely prayer! Love how crisply this stamps one of my favs. Your card is lovely...love the little touches of white. What a lovely design! Very elegant and inspiring! Thanks for sharing. Grace, I just love this!! Thanks for sharing!! Stunning card; love it.Thanks for sharing. Beautiful card! I love the simplicity of the card and how well it shows off the prayer. What a divinely beautiful card. I love these stamps. Grace, this is exquisite! Love the colors and all your embellies - so rich and regal. Love the card. Everything is great. I love the prayer. I can hear my grandmother singing this; I think it was her favorite. Beautiful card, Grace! Truly beautiful! Brought back memories of my school days as we had to say this prayer daily at assembly. What a beautiful prayer and I love the fancy cut of this card. Just beautiful! Gorgeous card, and I do love this prayer. Just too pretty for words. The stamp is wonderful! I got my first pet when I moved into my first apt. She was a sweet Terrier/Dauschand mix and was a great friend until she passed a few years ago. I still think of her often. So simply yet so elegant. I like your style and I love this new poem. This is a beautiful card, love the prayer and the nestie. This may have been quick and easy but it looks like there was a lot of time and care put into it. Just lovely, and this is my favorite prayer. A truly inspiring card. Thanks so much for sharing! This is so wonderful card Grace. Beauitful, GRace!! Love the frame you made for the prayer! !